Detail from "Supper at Emmaus"
"There is nothing so indestructible as a symbol; but nothing is capable of so many interpretations." The symbolic usages of the eye can be divided into a number of types. First, the eye alone: this usage is the most open to a wide range of interpretations, and misinterpretations. It can be anything from representing the benevolent, omnipotent all-seeing eye of God to representing an evil malevolent being or society. It can represent security and protection when used by Pinkertons Detective Agency, or intrusive tyranny when used in movies to represent oppressive regimes, species or ideologies. The next most common representation is the eye inside a triangle. The equilateral triangle is a common symbol for Deity in any culture that has worshipped the triune nature of God. Examples can be seen in the Pfarrkirche at Grmunden am Traunsee, built in 1626, the Fishermans church at Traunkirchen, and the church of the monastery of St. Florian near Linz. The eye inside a glory, or radiating lines, more clearly defines the eye as representing the all-seeing eye of God and was a common Christian symbol in Renaissance art and early lithography. The hamsa, or eye in the palm of a hand, is an Arabic and Jewish apotropaic amulet for magical protection from the evil eye. The word hamsa, or hamesh, refers to the five digits on the hand. Also called the hand of Fatima, in reference to the daughter of Mohammed, or the hand of Miriam, the hamsa appears in a two-thumbed, bilaterally symmetrical form, as well as in a more natural form in which there is one thumb. Archaeological evidence suggests that the hamsa predates both Judaism and Islam. Examples can also be found in Roman art and South American hoodoo iconography. It has no masonic significance. The representation of an eye in or above a pyramid derives its usage from the unique representation on the reverse of the USA Great Seal, most commonly found on the American dollar bill. 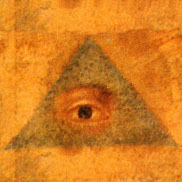 There is no documented illustration of an eye together with a pyramid prior to 1783. Neither the eye nor the pyramid have ever been uniquely masonic symbols, although the Grand Lodge of Italy incorporated combined the image into its seal in 1805. The combining of the eye of providence overlooking an unfinished pyramid is a uniquely American, not masonic, icon. While the all-seeing eye appears on early embroidered masonic aprons, there are no available documents showing the all-seeing eye associated with Freemasonry prior to 1797 and none at all related to the Bavarian Illuminati.